Lexington, KY, April 11, 2019 --(PR.com)-- It's easy to jump straight from Palm Sunday to Easter Sunday and miss the drama that unfolded on the streets of Jerusalem during Holy Week. 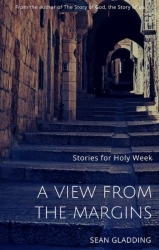 Author, pastor, and speaker Sean Gladding has published his fourth book, A View from the Margins: Stories for Holy Week to invite readers to slow down and catch a view of Jesus through the eyes of some of the minor characters whose stories are often overlooked. This fresh perspective on the events of Holy Week also provides questions readers can ask themselves as they consider the implications of what it means to live as Easter people. A View from the Margins: Stories for Holy Week is available for download on Amazon.com. Sean is a storyteller, pastor, community gardener, backyard chicken keeper and youth soccer coach. Born in England, he and his family now live, love, work and play in the MLK neighborhood in Lexington, Kentucky. Sean speaks regularly on college and seminary campuses, at conferences, churches, festivals and retreats. He is the author of four books beginning with the highly-acclaimed The Story of God, The Story of Us and most recently A View from the Margins: Stories for Holy Week. For more information about Sean and his books, visit his website at www.seangladding.com or connect with him on Facebook/seangladding, Twitter/GladdingSean, Instagram/seangladding, and LinkedIn/sean-gladding-45723b127.